Steemgigs.org (The Freelancing & Dream-Building Marketplace On Steem - Latest Development Update.steemCreated with Sketch. A revolutionary steem-based freelance marketplace & dream-building ecosystem, with its own knowledge-base, community and 'an untalented paradigm'. The Grand Picture: The Detailed FAQ(s) For https://steemgigs.org & All The Answers. "Steemgigs.org" is dedicated to my mum who passed away last year and i had let it die but in the last few days, we have worked on restoring steemgigs.org and we will begin its active development henceforth. If You Didn't Know About SteemGigs, Here Is Quick Summary. #steemgigs start more than 2 years ago. The first #steemgigs task request was created by @kus-knee more than 2 years ago. The first SteemGigs testimonial post happened more than 2 years ago. The steemgigs.org slogan is "everyone has something to offer". Did you notice that a successful steemGIG happened some 2 years ago? @kus-knee had created a custom request at the time, to which @fisteganos offered his service. 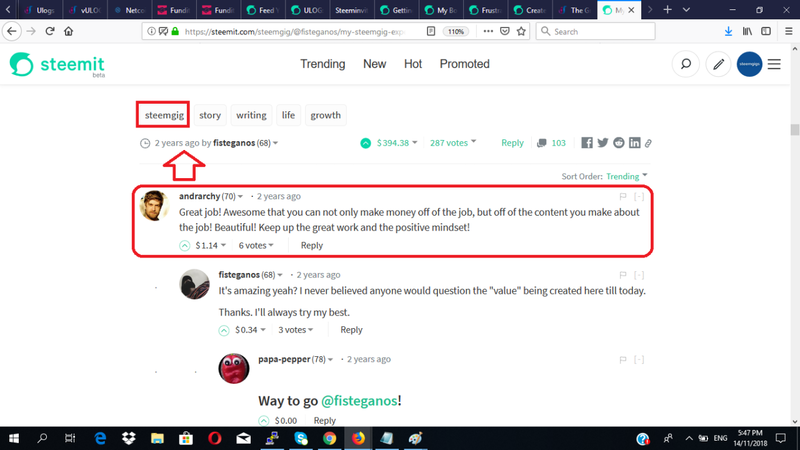 @fisteganos got paid in SBD and then went on to earn an additional 394 $ from his eventual SteemGig Testimonial post. More recently, @acidyo brought a similar topic up in his post here: Why VoiceOverPete should join Steem! 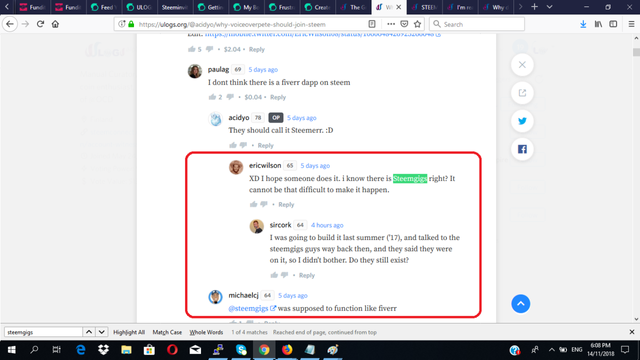 Looking at the comment section of the post, you will notice that steemians still remembered SteemGigs. And here is some passionate video(s) evidence. You can support the 'steemgigs' witness. Please visit https://steemit.com/~witnesses and vote on 'steemgigs'. It is currently ranked #60. Our recent task request spans across 14 micro-programming issues and @tobias-g has tended to some of these issues. Below, i will expand on some of the tasks that @tobias-g has completed so far as well as additional development tasks that he worked, on his own loving volition. Our aim is to use these editors to incite users to 'serve the search engines'. Each of these editors thus, have to be simplistic, interactive and intuitive. In the past, the 'create-a-gig' editor was made up of multi-pages. Users had to pass through several pages to complete each segment of the editor (i.e Title > Description > Pricing > Requirements > Delivery > Portfolio). This must have created a measure of hassle for users. Now users can have a general overview of what input the 'create a gig' editor, will require of them, all on one page, making them better inclined to complete their gig-posts. Where they have made an error, they can now correct errors on the same page. To keep the editor less bogus, @tobias-g added a collapse component to each segment of the editor. Users can collapse/expand these areas at will. Looking closely, you will also notice the stamp of @tobias-g, on the general styling of side-text-box that characterizes all our editors. Next, he improved the metadata for steemgigs.org to improve how the website gets indexed in the search engines and to make steemgigs.org more presentable in search results. @tobias-g also fixed a bug on our homepage (prior to login), that prevent users from navigating the page. In the coming days, we will start working on the more complex/core tasks. We will like to enhance our search portal, by improving on categorization and add a 'sorting' mechanism. Then we will work on enhancing our landing page, adding an optional escrow functionality and private message. We plan to work the hardest within the month of January. We will begin to invite users to test steemgigs.org once again, once we have completed the search and categorization functionality. Then, we will seek to re-open steemgigs.org to public use just thereafter. While i am not usually very frontal with asking support, you may decide to support my efforts at this point as i really need support. To do so, @steemgigs is now open to delegation and where you see fit, "donations". Within the next few months, 'delegation' will be focused towards supporting contributors, especially to the development of steemgigs. This will help us speed development, to where steemgigs.org primary functions are ready within a month or two. Regardless, i will keep using my resources, financial and otherwise, however limited, to bring steemgigs.org to full-blown life. This is a slower route but my healing lies in, "gifting the world with some awesomeness via my projects". This is an amazing update! This post is chock-full of useful information about the Steemgigs project. It took me back to the genesis of Steemgigs, and I understood the project has a lot of great potentials. I haven't reviewed any contribution from you in the past. However, I'm glad to review this one because it's quite comprehensive. I like the steemgig slogan "everyone has something to offer". I believe no talent is a waste it all about reaching the right people. @tobias-g deserve an accolade for his recent work on the project. It's cool to see folk here on Utopian doing awesome stuff. Thanks for all the information you provided in this post, and I wish surpassinggoogle and Steemgigs best of 2019. 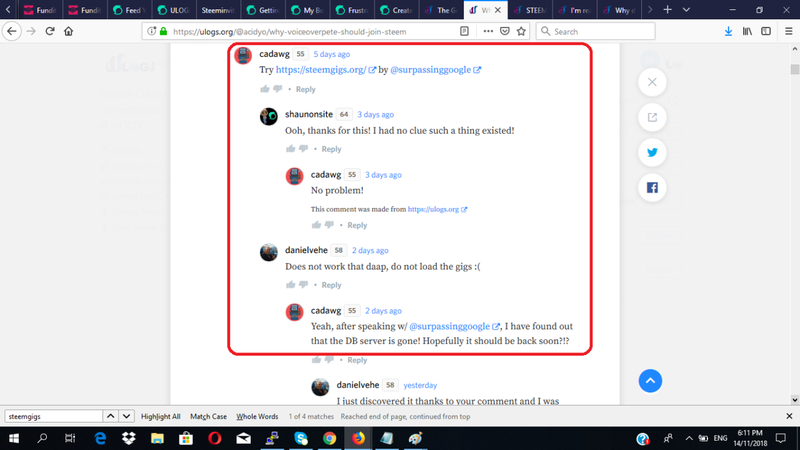 I think one of the biggest problems to solve after looking into fiverr is they are able to remove negative reviews anytime they want just by refunding, so people leaving a review saying 'this is a scam here are reasons why' are essentially silent while weirdo bot dudes are all 5 stars. So the whole thing becomes a shady minefield. A blockchain version of a gigs platform wouldn't have that problem I think, so +1 in my book already, and if it's on steem that's even better. Overall this looks epic, well made, and very cool. Thank you for all the encouragement. Steemgig isn't a baby project on the steem block chain. Coming back to stay is awesome. I really love what @tobias-g has done so far, and I'm very optimistic about the revival of the platform. More power your elbow. Thank you alot. Yes, it isn't but alot happened that slowed it. Now there is serious push at least from a physical standpoint. This month it should start off and yes, stay. Thank you for always having the good of the community on your mind and in your actions! I will delegate some as soon as I get to my computer. You are awesome! Thank you. It is not much, but if many do a little - it will add up. Looking forward to see where the project will go. It will be huge for the Steem!! If theres an android app, why no iOS? Oh yea, thats a good idea. I couldn't read posts on the site just 2 days ago. Hopefully it's fixed by now. Crosses fingers. Thank-you for the update, this is my first time learning about steemgigs and i will dedicate sone time to learn more on the project & how i can make use of the platform. Unfortunately, I don’t have enough SP for delegation to the project & I’m not a developer, I can only resteem this article and maybe write a few blog entries about steemgigs as a gesture of help. @surpassinggoogle, It's reflecting as the development process is moving ahead effectively. Brother you know about the Linkseven77 Initiative by @nathanmars. Kindly, looking forward for the ZNAP7 video (Introductory Post of your) and And an separate video for your projects so that it can be added to Linkseven77 Hub brother. Kindly find the below post for your kind reference. Steemgig isn't a baby project on the steem block chain. Coming back to stay is awesome. I really love That and I'm very optimistic about the revival of the platform. More power your elbow. I posted an article using #Ulog today. Is there a possibility of being supported?